St Gemma’s Catholic Pilgrimages has graciously selected ME as their Official Catholic Blogger! I’m going to Rome with them on their Sept 22-Oct 3, 2014 Pilgrimage! 1. Find a great Catholic Tour company…like St Gemma’s Catholic Pilgrimages It’s Catholic!…and Mike and Sue are awesome hosts! 3. Consider and invite WHO you would like to travel with. I recommended an awesome chaplain…and it was confirmed that Fr. 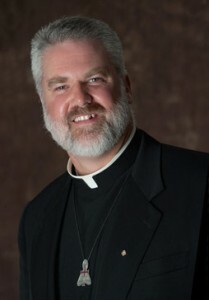 Scott McCaig will indeed be the chaplain for our pilgrimage Sept 22, 2013- Oct 3, 2014! Fr. Scott McCaig is the General Superior of the Companions of the Cross…and he’s a close family friend whose vocation we confirmed through his stay with us a week after our first baby was born. I think Mike and Sue will be great travel buddies too! 3. Research WHERE you want to visit and PRIORITIZE. 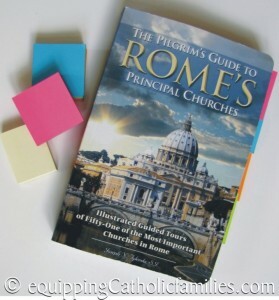 I recommend this book that I continue to LOVE: The Pilgrim’s Guide to Rome’s Principal Churches. 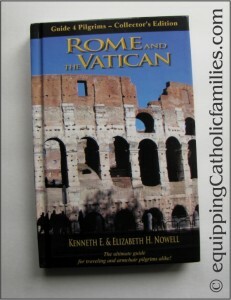 I am also so happy to have received this book: Rome and the Vatican by Kenneth and Elizabeth Nowell, available through Vero House Publishing. 5. Figure out WHO IS GOING TO HELP MY HUSBAND look after our FIVE kids for TWELVE whole days! 7. 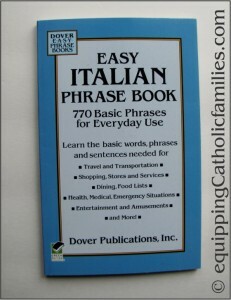 Brush up on ITALIAN!…although Mike and Sue say “…you don’t need to know Italian. 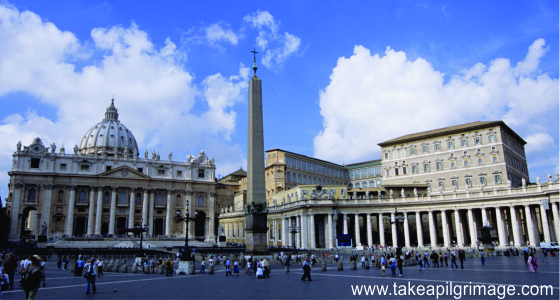 A phrase book is helpful, but Italians in Rome often speak English and are very friendly and helpful”. Lisa Hendey said pretty much the same thing…although she did learn “a tiny bit of Italian, just to be polite” and recommended DuoLingo. Lisa says it’s free and very fun! 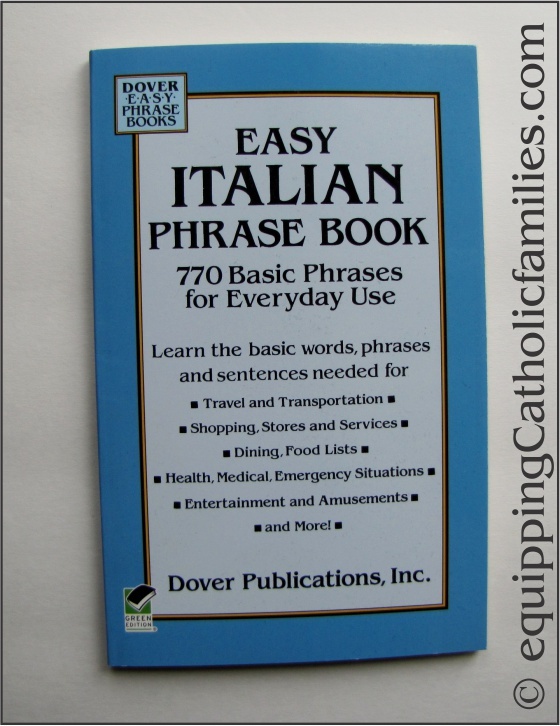 Mike and Sue also recommend Rick Steves’ Italian Phrase Book & Dictionary and I picked up the Easy Italian Phrase Book: 770 Basic Phrases for Everyday Use (Dover Language Guides Italian) and tucked it into an Amazon order to get free shipping. 8. Get my walking shoes on! Mike and Sue say that we don’t have to be in excellent physical condition, but we do need to be able to walk up to a mile at a time on our own. I want to see a lot…so I expect to do a lot of walking! 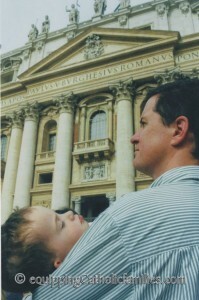 Monica, mom of 5, is usually blogging about Catholic crafts and family traditions at EquippingCatholicfamilies.com. She is the author of A Treasure Chest of Traditions for Catholic Families, Hand in Hand with Jesus (a Faith Journal through the Sacraments) and a series of paper Cathletics Craft Kits and Cathletics quizzing cards to help teach the Catholic Faith. The Catholic teaching tools and gifts are available through Arma Dei, the Catholic family publishing company founded with her husband Bill. Monica is also one of the founders of the Catholic Bloggers Network, a venue to link and promote Catholic blogs.